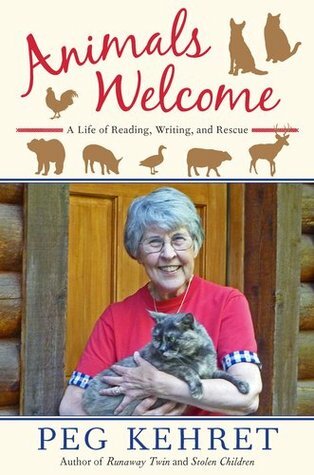 Animals Welcome: A Life of Reading, Writing, and Rescue by Peg Kehret. Grades 3-6. Dutton Books, 2012. 173 pages. Copy provided by my local library. Author Peg Kehret loves animals. I mean she loooooves animals! - Peg and her husband had their property declared a wildlife sanctuary. They've seen deer, elk, and even bears on their property and rescued many animals. - Peg co-authored three of her books with a cat! - She kept a pet cat who wouldn't allow her to pet him, turned her late husband's workshop into a home for foster cats, and she's spent thousands of dollars on vet care for stray animals she's rescued. In Animals Welcome, Peg Kehret writes with warmth and humor about the animals she has known and loved. The writing is friendly and personable and she shares information she's learned about animals throughout the book. She also writes about animals in her novels that are based on animals she's known in real life. I'd definitely classify this as a memoir, not an autobiography, since Peg concentrates on a specific aspect of her life. She includes photos of some of the animals she talks about and information about how to treat animals kindly. I can definitely see this book inspiring young readers to stand up for pets that are being mistreated or to get involved at their local animal shelters. This memoir is sure to please animal lovers and anyone who cares about their pet (or wishes they could have a pet!). I'd also recommend it to fans of Peg Kehret's other books since she talks about the animal characters in her books and also about fans of her writing that she's met through her work with animals. Looking for another true story of a person passionate about animal rights? Try Temple Grandin: How the Girl Who Loved Cows Embraced Autism and Changed the World by Sy Montgomery. Readers looking for more true pet stories might like Marley: A Dog Like No Other by Jon Grogan or Dewey the Library Cat by Vicki Myron (both are young readers' versions adapted from adult books). Fiction series and novels about pets abound, but two I might recommend are Ribsy and Socks by Beverly Cleary for their gentle tones. Animals Welcome is on shelves now!